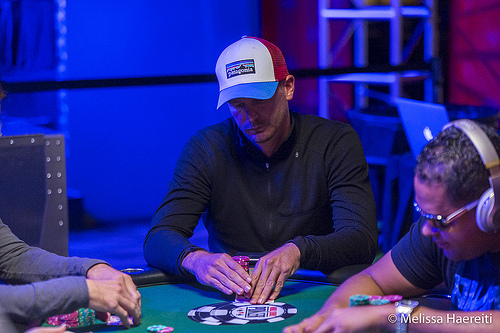 Action folds to Viatcheslav Ortynskiy in the small blind, and he raises to 150,000. Randy Ohel three-bets from the big blind to 425,000, Ortynskiy four-bets to put Ohel to a decision for his whole stack, and Ohel calls. Ohel is in the lead with a pair of queens. The board runs out which improves neither player and Ohel doubles up. Randy Ohel raises the pot to 175,000 from the button with 200,000 behind. In the big blind, Rafael Lebron reraises the pot and Ohel calls all in. The board comes and Ohel doubles with two pair, tens and deuces. Matthew Humphrey limps from under the gun and Rafael Lebron calls, Viatcheslav Ortynskiy raises to 105,000 and both his opponents call. On the flop, all three players check. Humphrey bets 100,000 and Lebron calls, Ortynskiy folds. The appears on the turn and Humphrey checks, Lebron bets 260,000 and wins the pot. Lebron raises to 110,000 from under the gun and Humphrey calls in the big blind. The flop comes and Humphrey checks. Lebron bets 130,000 and Humphrey folds. Humphrey limps the small blind and Lebron checks in the big blind. On the flop, both players check. Humphrey also checks the turn and Lebron wins the hand with a bet of 100,000. Rafael Lebron starts the action with a raise to 125,000 from the button, Viatcheslav Ortynskiy calls from the small blind, as does George Wolff in the big blind. The flop comes . Ortynskiy checks, Wolff checks, and Lebron makes a pot-sized bet of 325,000. Ortynskiy calls and Wolff check-raises all in. Lebron folds, and Ortynskiy goes into the tank for several minutes. He counts his chips out a few times, and calls. Wolff is in the lead with Broadway, but he must dodge a club as Ortynskiy has a flush draw. The on the turn gives Ortynskiy his flush and leaves Wolff drawing dead. The meaningless falls on the river to complete the board, and Wolff is eliminated. George Wolff limps in from under the gun, as does Matthew Humphrey on the button. Rafael Lebron calls from the small blind and Viatcheslav Ortynskiy checks his option in the small blind. On the flop of , all four players check. Lebron bets the turn for 110,000. Ortynskiy calls, Wolff calls, and Humphrey folds. The river completes the board and Lebron bets 275,000. 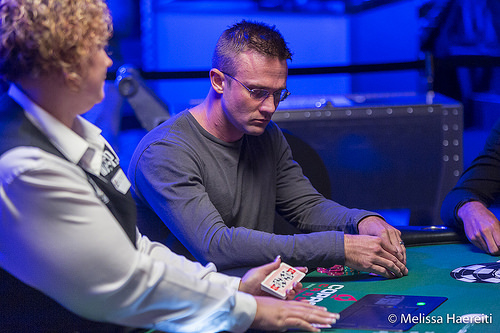 Ortynskiy folds and Wolff checks his stack carefully before moving all in for 740,000. Lebron calls and Wolff announces jacks full, flipping over . "Nice hand," Lebron says as he mucks his for an inferior full house. Wolff double. Matthew Humphrey calls from under the gun and Viatcheslav Ortynskiy raises from the button to 150,000. Humphrey calls and the two players go heads up. Humphrey checks, Ortynskiy bets 225,000, and Humphrey check-raises all in for a total of 570,000. Ortynskiy tanks, folds after a few minutes, and shows the as he mucks. George Wolff raises to 80,000 from the cutoff and Ohel moves all in for 295,000 in total. All other opponents fold and Wolff calls. The board runs out and Ohel doubles up. 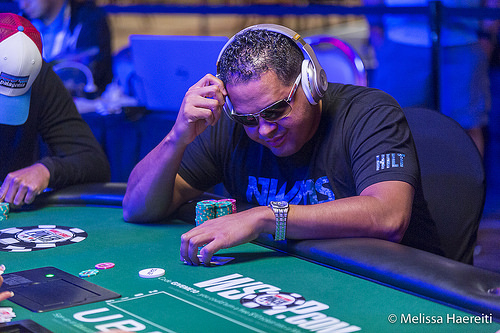 Rafael Lebron (pictured) raises to 125,000 and Randy Ohel calls in the big blind. The flop comes and Ohel checks. Lebron bets the pot for 270,000 and Ohel calls. After the turn, Ohel checks again and Lebron bets the pot for 810,000. "How much do you have in total?" Ohel asks and Lebron has another 160,000 behind for 970,000 total. "Okay, I am all in," Ohel says and Lebron quickly calls, announcing three aces. The river is a blank and Lebron scores a big double up, leaving Ohel very short. 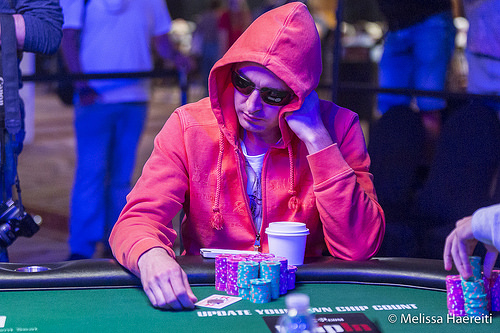 Rafael Lebron raises from the button and George Wolff calls in the big blind. On the flop both players check. The comes on the turn and Wolff bets 140,000, Lebron calls. Wolff checks the river and Lebron bets 270,000. Wolff quickly calls. Lebron says, "You got it," briefly showing his for a missed gutshot and flush draw. Wolff claims the pot with for a flush. Randy Ohel starts the action with a raise to 100,000 from under the gun and Viatcheslav Ortynskiy calls from the big blind. The flop comes and Ortynskiy checks. Ohel bets 100,000 and Ortynskiy calls. The turn brings the and Ortynskiy checks again. Ohel bets 275,000 and Ortynskiy check-raises to 1,295,000. Ohel goes into the tank, eventually moves all in, and Ortynskiy calls to put himself at risk. Ohel has aces and the nut flush draw, but is behind Ortynskiy's set of kings and needs a club or an ace to win this pot. 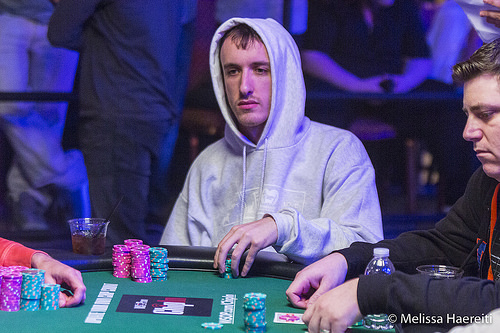 The on the river is no help to Ohel and Ortynskiy doubles up to become the chip leader. The action seems like it's slowing down with five players remaining. Here's the last orbit. Viatcheslav Ortynskiy raises the pot out of the small blind and George Wolff folds. Ortynskiy raises to 100,000 from the button and claims the blinds and antes. Randy Ohel limps in the small blind and Matthew Humphrey checks. 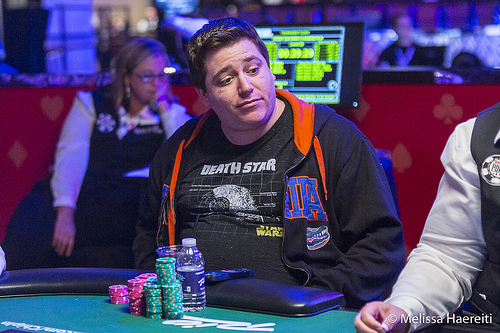 On the flop, Ohel bets 55,000 and Humphrey folds. Ohel raises to 80,000 from the button and Rafael Lebron calls in the big blind. After the flop, Lebron checks, and Ohel's bet wins the pot. Lebron limps the small blind, Ortynskiy raises the pot and Lebron folds. Viatcheslav Ortynskiy opens from under the gun with a raise to 100,000, Matthew Humphrey moves all in from the small blind, and Ortynskiy calls. Humphrey is in the lead with a pair of kings, and the board runs out to give him the double-up. Viatcheslav Ortynskiy opens from the cutoff with a raise to 100,000, Randy Ohel calls from the small blind, and Matthew Humphrey calls from the big blind. The three players see a flop of and everyone checks. The falls on the turn and action checks around again. The river brings the and Ohel bets 175,000. Humphrey and Ortynskiy both fold and Ohel takes the pot. In a battle of the blinds, Viatcheslav Ortynskiy limps in and George Wolff checks his option. On the flop, both players check and do so again after the turn. Ortynskiy bets the river for 30,000 and Wolff calls. Ortynskiy rolls over for a full house and Wolff mucks. Randy Ohel raises to 75,000 from under the gun and Joshua Gibson, who is next to act, three-bets to 275,000. Action folds back around to Ohel who announces that he is all in, and Gibson goes into the tank. He asks Ohel, "Do you have ace-king-queen?" Gibson ultimately decides to call and is all in. Ohel is ahead with a pair of aces and the flop comes . Gibson is drawing dead against Ohel's full house. The on the turn and on the river complete the board and Gibson is eliminated. Rafael Lebron raises to 80,000 from under the gun and Randy Ohel calls on the button. Both short-stacks in the blinds, Joshua Gibson and Matthew Humphrey, call also and it goes four-ways to the flop. The flop is . Action checks to Lebron, who bets 160,000. Only Ohel calls and the comes on the turn. Lebron checks, Ohel bets 380,000 and that sends Lebron into the tank. After some consideration he asks, "How much?" He gives it another minute and folds. Viatcheslav Ortynskiy starts the action with a raise to 75,000 from the cutoff and George Wolff calls from the button. The flop comes . Ortynskiy bets 100,000, and Wolff folds.